Maybe it is the lure of fireworks like at Disney's EPCOT or something about glowing embers of a campfire. The drive to work involves a 5 minute trip up 6 floors of a concrete parking garage unless Divine Intervention allows a closer parking space to the elevator. It only took a brief spark to whip out my Canon EOS Rebel T2i and start capturing glorious HD footage. 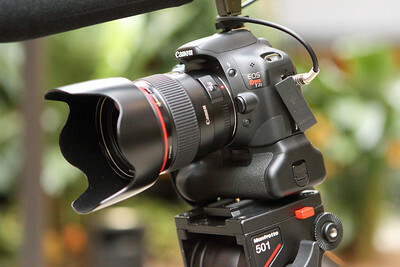 This is my third video installment of the Canon EOS Rebel T2i DSLR. Salamat Po!, I said to the welding crew in the parking garage. It is fortunate for me that my Filipino brothers embraced me with their open arms. They loved that I was photographing and videotaping them. 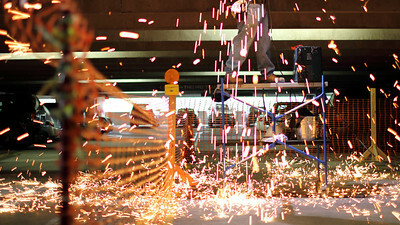 They must be just as passionate in welding as I am in photography. I knew there was a magical connection between the crew and I because our mutual desire for Jollibee! All this talk of Fried Chicken is making me hungry. Can we talk about the Video? I shot the video in full manual movie mode. Used Full HD settings at 29.97 fps. I opened up the Canon EF 35mm 1.4L lens wide open to get that dreamy bokeh. The panning and tilting is from my trusty Bogen 501 fluid head with 3221wn legs. I did not use the shotgun mic you see in the above picture but I used the mono on board mic. The ambient noise in the garage was filled with car alarms, jack hammers and traffic. Clean audio was not practical at the time anyway. To minimize flicker, I manipulated the shutter speed,ISO and aperture. It was not the most ideal lighting situation with daylight,florescent and incandescent all mixed in. I ended up with a shutter speed of 1/125,f1.4 and ISO 1600. As for editing the clips, I used iMovie'09. It is a wonderful thing just to drag the H264 files into the project bin and start editing right out of the gate.Thank you, Steve Jobs for iMovie'09 and less of a thank you for the upcoming and overpriced Apple iPad. If you have not seen already, my initial Canon EOS Rebel T2i Review and my Video and Image T2i Gallery has ISO,Image and Video Quality comparisons. Hello Chad I wonder where do you buy the mic for the camera?. And what is the lens that are you using for your Disney-family shot? Its seems that work terrific in low light condictiona and high ISO. I have a Canon T1i. Thanks for visiting my PhotoBlog! As for the mic choices, the best out of the box deal is the Rode VideoMic. You can get it at Amazon or B&H PhotoVideo.com. 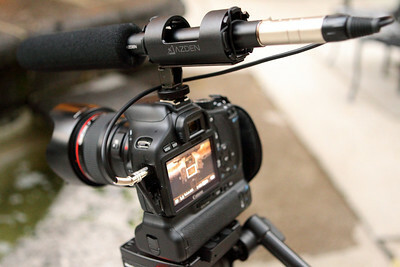 If you have an XLR microphone already, you can use the Pearstone LMT-100 adapter.Search for it on B&H PhotoVideo.com. I am not really sure what Disney picture you are referring too. Maybe you can tell me which gallery or blog post it came from so I can answer your question. The photos that I look was Disney Cruise. BTW there are all beatifull. Nice job. Chad, I was considering upgrade the lens of the camera. I bought the rebel T1i and the kit that come with it(EF-S 18-55mm f/3.5-5.6 IS Lens) dont impres me in sharpness and details of the subject. I love to take photo of my family and iwas looking for Canon, Sigma or Tamrom. I know the Canon L series are the best and the more expensive, but Its there's such a difference between the same lens specification( supose the 18-55mm f/2.8) and brand. I know also the diferences in construction. But its theres a difference in quality of the photo? Thanks for clarifying the gallery. The lenses I used for the trip were the Canon EF 24-105 f4 IS,EF 70-200 f4 IS and the EF 17-40 f4. As for the upgraded lens for the T1i, the best value is the Tamron 17-50 f2.8 VC. The non-VC is less expensive but VC is essential for steady handheld video. The ultimate lens for a cropped sensor is the pricey Canon EF-S 17-55 f2.8 IS. It is very sharp and has minimal distortion at the wide. The Tamron is great if you find a good sharp copy. Quality control at the Tamron factory is spotty at best. Before you buy, check the sharpness and possible backfocus. I know that is difficult with online purchases and that is why Brick and Mortar stores are so valuable. Hi Chad, thanks for that. I am thinking of upgrading my PC to a Mac to be able to quickly and easily edit my 550d videos. I tried out a iMovie at the apple store but am not sure about the output. I am sure its my settings. What format ( in PAL, HD) would you recommend for recording 24fps or 25fps in order to get the highest quality output for DVD and youtube? Also, I got the Tamron lens with VC and because i am a newbie am not really sure how to properly test for sharpness. I did the ruler test for focus to make sure it doesnt back/front focus, but dont really know of a good way to test for sharpness. After you complete your movie in iMovie'09, go to Share drop menu to Export to Quicktime movie. Go to options below in the new window and click the video settings button in the movie settings window. Your Compression settings should be H264 and keep everything default. You might want to adjust the compressor quality slide to your desired file size. It is a trial and error guessing game how big your file size will be. As for DVD, you can export out directly to iDVD in iMovie. It will downrez the file for you. Good choice on the Tamron VC. Put it on tripod and use center point focus in good light with low ISO and take a picture. If you zoom in on the LCD, you can check the focus. The other method is to tripod the camera and shoot a measuring ruler at a 45 degree angle. The center focus point should be focused on a number and you can tell if the camera has front or back focus. Thanks Chad! I dont have a tripod but will try and find a stable place to put the camera down. I think its capable of sharp photos, i just dont know about its af accuracy. I rented the canon 2.8 17-55 this weekend and feel like with that one you're a lot more likely to get the focus right...but it's most likely that I just need more practice. For the video capture, do you shoot at 24fps for full HD? whats the benefit of 24 vs 25/30? Yes, the Canon EFS 17-55 f2.8 IS has faster focus by far. As long as you use center focus point and your Tamron has calibrated focus, your pictures should be razor sharp with the aperture wide open. As for 24p and 30p, it is all preference. I tried the output for both and I prefer 30p. I just like the look of 30p. Try both and decide for yourself. Hi Chad. Love your work. could you contact me at sales at slappa dot com. I'm interested to talk with you about some video work we're looking to get done.